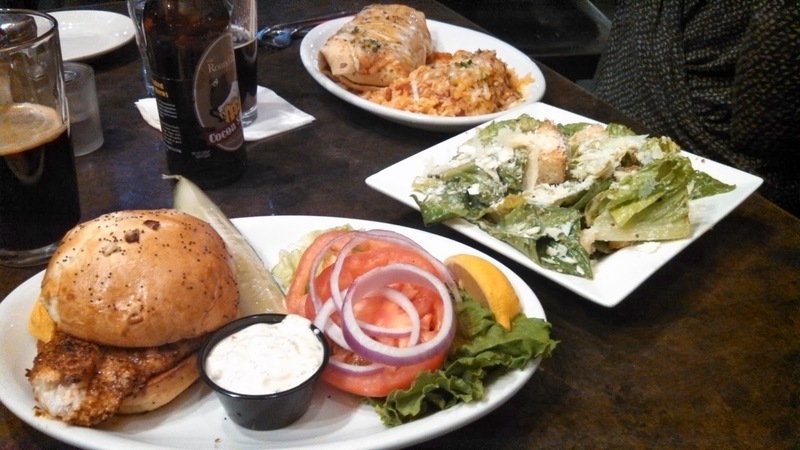 For dinner, I ordered the blackened catfish sandwich. The sandwich was spicy, but not overbearingly hot, and the fish itself was delicious, not too fishy and not dried out like some blackened fish. My wife ordered a vegetarian burrito that she enjoyed. 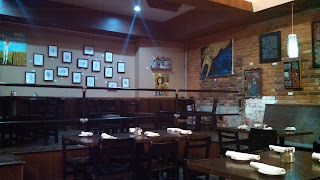 I would definitely visit the Majestic Cafe again and would recommend it to anyone visiting Midtown. 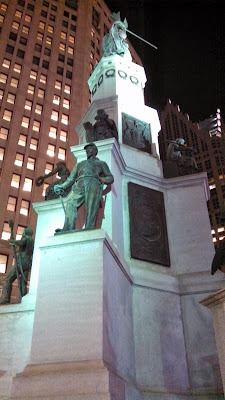 After dinner, we drove down Woodward to Campus Martius. I was eager to see the Christmas tree and outdoor rink. As we drove down Woodward towards Downtown, we drove past buildings and storefronts draped in holiday lights. Woodward looked like Christmas should look in a big city. Campus Martius was amazing, especially considering how the area looked ten to fifteen years ago. The old Michigan Soldiers' and Sailor's Monument is still there, though it was moved 125 feet south ten years ago as part of the redevelopment of the site. The ice rink was packed with people, and there was a long line to rent skates and get tickets for ice time. 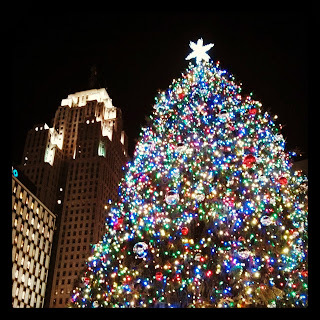 The whole area around Campus Martius felt festive. There was a lady dressed as a toy soldier walking around on stilts, large fire pits for people to warm up, and of course the giant Christmas tree. Next door at Cadillac Square's Holiday Market, vendors sold fold food and crafts from outdoor huts, and a beer garden awaited thirsty skaters at the end of the market. At the entrance of the market, we stood next to the world's largest Salvation Army Kettle while watching two fire-eating dancers entertain the crowds. Campus Martius is not Rockefeller Center...yet. The area immediately near Campus Martius definitely could use more restaurants and retail shops that are open in the evening, but the area is getting stronger. Its renewed strength was evident in the many people who ventured downtown to have fun outdoors on this cold November night. As we walked around the ice rink, my wife commented that if Campus Martius and Cadillac Square had offered this much when she was in high school, she would have been Downtown all the time in the winter. Clearly, her opinion was shared by the many smiling faces we saw huddled up around fire pits, skating around the rink and strolling through Cadillac Square. If you have not visited Campus Martius in the last few years, you are missing out on a true renaissance within Detroit's city limits.